Am I happy? Hmm…I would like to believe that I am but after reading about "The Sedona Method", I may not be as happy as I think I would like to believe. I mean I am happy but I can probably be happier, you know. We all try to be happy one way or another. We do several things to make it happen and yes, these things make us happy….temporarily. The way I see it, temporarily happiness is brought about by different reasons. Yes, these reasons are the key to temporary happiness. Once these ‘reasons’ are gone, happiness would usually go with it. But is a ‘reason’ really needed to be happy? Can’t we be happy for no reason at all? Of course we can and that is what’s in this book titled: Happy for No Reason. 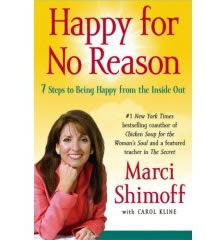 It is a book written by Marci Schinoff. She is one of the featured teachers in: The Secret. In the book she aptly compared Borneo monkeys to people. Well, not physically but how monkeys and people remain trapped in something. For the monkeys, it’s being trapped on a coconut shell simply because they wouldn’t let go of something…rice. For people, it’s being trapped with negative thoughts. It seems that for a lot people, this is the main reason why they can not achieve real happiness. Some may push these thoughts aside resulting to again, temporary happiness but once these thoughts creep back in, they are back with where they started. Interesting, isn’t it? Aside from being interesting, this book by Marci Schinoff is also very educational. So check it out at the Sedona website. They also have some free DVD and CD that anyone can get. These may just turn into your favorite DVD and CD once you get your hands on them.